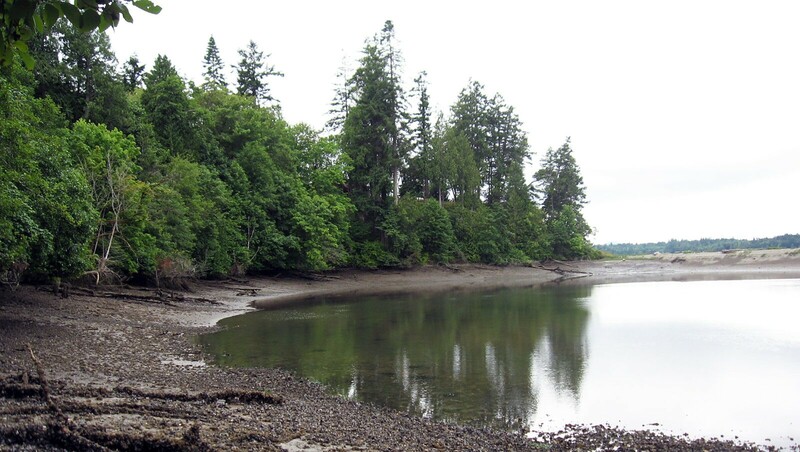 47 acres located on the southern half of Gull Harbor, along the eastern shores of Budd Inlet, in northern Thurston County. The property consists of primarily level, gently sloping agricultural fields surrounded by a diverse mixture of deciduous and coniferous woodlands, and bounded also by steep banks above saltwater shoreline and accompanying tidelands. The property provides critical habitat to many unique and threatened animal species including red fox, California sea lion, bobcat, coyote, river otter, beaver, Pacific tree frog and numerous other mammals and amphibians, as well as waterfowl, songbirds and shellfish. This property borders the Bayfield Gull Harbor Conservation Easement, creating contiguous habitat for many of these species. Conserve wetlands, riparian areas, and associated wetlands. The tide flows into Gull Harbor like a slowly drawn breath. Periodic splashes announce a kingfisher’s plunges from its hunting perch, and the awkward calls of a great blue heron echo in the calm. On clay bluffs above the harbor the steady rustle of maple leaves and cedar boughs is a backdrop for other sounds: the ringing call of the Swainson’s thrush, the rat-a-tat of a pileated woodpecker’s excavation, the gentle chatter of chestnut-backed chickadees feeding their young. A bald eagle watches our progress, aloof in its perch across the bay. Perhaps it recognizes the leader of our small expedition, for Leslie Cushman has roamed these bluffs since she was a small child. Leslie is one of a long line of Cushmans that have enjoyed the property. It has been in the family since 1914, and current owner Dan Cushman, Leslie’s father, has protected it with a conservation easement in memory of his late wife, Julie. Birdsong accompanies us as we work our way along the bluff. The varied calls prompt Leslie and the others in our group to begin listing the birds and animals that frequent the property: “We hear barred owls, screech owls and barn owls. Foxes seem to like the big field, and occasionally we see coyotes and bobcats. There are Bewick’s wrens and winter wrens, western tanagers and red-breasted sapsuckers. This spring we watched a pair of pileated woodpeckers raise their babies! Osprey and red-tailed hawks nest here, but bald eagles just visit. We have mink and weasels, and don’t forget the river otters!” The recitation continues as we move from the moist banks on the east to drier, steeper bluffs facing north and west. I notice how dynamic the landscape seems. Intermittent streams and springs form moist habitats. Trees slide down the bluff and litter the beach, offering hunting perches for birds and changing the patterns of deposition on the beach. Winter storms open the forest canopy and create snags used by cavity nesting birds. Leslie brings us to a ravine, where springs have created a moist grotto of ferns and western red cedar. Years ago a narrow-gauge railway ran down this ravine to the beach. It carried bricks fired in the kiln of the Wepusec Brick Company, which operated from 1910 to 1914. The kiln stood in the fields above us and clay was mined from a pit nearby. The bricks were barged to Olympia to be used in building foundations. “Wepusec” was the local Indians’ name for Gull Harbor, and the name assigned on maps made by the Wilkes Expedition in 1841. We explore the site of the old kiln and the fragments of bricks that keep coming to the surface. In a large field nearby Leslie points out the venerable survivors of an apple orchard planted in 1900. The trees are Olympic Baldwins, a variety developed by county extension agent Ed Shincke (of Shincke Road fame). This orchard, and a prune orchard a quarter of a mile away, were planted to supply dried fruit for the Alaska gold rush that began in 1898, although the gold dried up before the trees began producing. We stop near Julie Cushman’s favorite spot, the view from her yard near the high point of the property. From this vantage point you get a sense of how much is encompassed in these 48 acres: large fields, mixed forest, grazed woodlands and extensive saltwater shoreline. My gaze sweeps the meadows, the gnarled remnants of the apple orchard, and great trees framing the glassy calm of Puget Sound. The view that Julie Cushman loved is now protected, and with it the creatures that call this place home.